Handcrafted Metal manufactures seamless premium zinc commercial bar tops with many edge designs ranging from classic to modern. Our zinc Deco edges recall Paris in the 1920's, while our simple channel edges fit with modern themes. Practical features of our zinc bar tops include built-in liquid tight drink rails and flip-gates with matching edges. We fabricate zinc bar tops with real, fully welded, 16 gauge pure zinc sheet. This is vastly superior to slip-casting, which is actually metal sprayed onto wood. We can ship our custom seamless zinc bar tops anywhere in the US. A substantial marine Italian edge gives this 34 ft bar top a commanding presence. The drink rail at the rear has a marine edge for full control of spills. All welded 16 gauge smooth zinc, natural hand rubbed highlight finish. 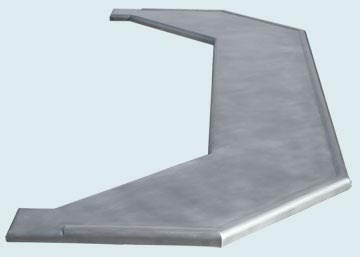 This large U-shaped commercial bar top features 23" radius corners. Our Marine Bistro edge provides spill control. All welded 16 gauge smooth zinc, natural hand rubbed highlight finish. Our Parisian edge graces this large commercial bar top. This tall edge scales nicely with the large format, and the dentil pattern on the middle of the edge adds fine detail. This countertop was too large to ship in one piece because of shipping limitations, so we built it in 2 pieces with an unwelded seam positioned on the short side. All welded smooth 16 gauge zinc, natural hand rubbed highlight finish. Our simple Mon Ami edge gives this modern top a touch of style. The U shape and front extension provide interesting geometry. All welded 16 gauge smooth zinc, natural hand rubbed highlight finish. A sweeping rounded corner unifies this L shaped bar top. The Marine Bistro edge provides excellent spill control, and the large 56" radius of the corner provides a continuous perimeter for seating. The curved drink-rail provides spill control along the entire back edge. All welded 16 gauge smooth zinc, natural hand rubbed highlight finish. This 4-sided island bartop has a combined length of 50 ft, including a flip gate. The outside edge is a 3" Bullnose edge, and the back edge is our Normandie Drink Rail. 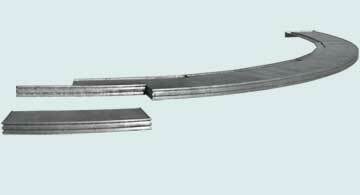 This bar top shipped as two L-shaped sections, one large U-shaped section, and a flip gate. The U-shaped side has a cutout for a beer tap. The large bullnose front edge required a solid epoxy and wood support structure to support the edge and provide a mounting surface for zinc bottom panels. All welded 16 gauge smooth zinc, natural hand rubbed highlight finish. This impressive bar top features our 6" Parisian edge on the front and continuous drink rail on the back edge. The edges all have the our rock-solid reinforced backing. As a seamless single-piece, this top just barely fit into a shippable crate. All welded 16 gauge smooth zinc, natural hand rubbed highlight finish. This rounded corner bar has an embossed inset that gives emphasis to the edge. The marine edge on the front and drain rail on the rear keep spills contained. The notch in the center is a framed opening for a sink. All welded 16 gauge smooth zinc, natural hand rubbed highlight finish. This commercial bartop features our Bistro edge with extended bottom trim, which gives this top a taller profile. Job site access required that we ship this top in 2 sections. All welded 16 gauge smooth zinc, natural hand rubbed highlight finish. A unique front counter for a New York bar that serves cupcakes and margaritas. The embossed String Of Pearls detail is inset into the smooth front edge. The String of Pearls edge was chosen to match a series of dots in the bar's logo. We rounded the exposed left-front corner. All welded smooth 16 Gauge smooth zinc, natural hand rub highlight finish. We built this 27' x 7' L countertop in the most economical manner possible, and shipped it as zinc-only without substrate, in 4 separate sections. The rear edge is a drink rail, and the 6" Italian edges provide a substantial appearance in keeping with the large size of this top. It was installed on-site in separate sections. Smooth 16 gauge welded zinc, natural finish with hand rub. This curved commercial top was installed in a Crown Plaza Hotel bar in Chicago. The front edge is our Marine Italian profile, and the rear edge has a faceted drink rail. Due to site access limitations, we built this top in 4 sections with hairline seams. The notch at the front right accommodated a lower ADA-compliant bartop with matching edge. All welded 16 gauge smooth zinc, strong pattern patina. This 24 ft long countertop was made for a hotel bar, and features a marine Normandie edge and integral drink rails at the rear. We shipped this piece in three sections because there was no access into the establishment as a single-piece seamless top. Because the drink rail needed to be liquid-tight, we welded end-caps at the ends of each section. 16 gauge smooth zinc, natural hand rubbed highlight finish. 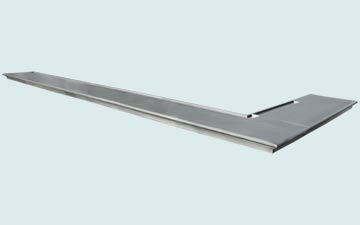 This 29 ft long zinc bartop terminates at round columns on both ends. At the left there is a lift-door and a section beyond (not visible in these photos) that terminates with another semi-circular cutout for a column (also not shown). We shipped it in 2 large sections, with the flip gate and left end separated. The semi-circular cutouts at the two ends accommodate black granite columns, which form the end points of a completely black granite wall behind the bar. The front edge is our Mont St. Michel, and the rear edge is our Normandie Drink Rail, which has a channel back edge. All welded 16 gauge smooth zinc, natural hand rubbed highlight finish. This zinc top surface was installed on a large wood bartop. A wood arm rail covered the raw edge of the curved outside perimeter. The inside back edge is a curved and welded liquid-tight recessed drink rail. All welded 16 gauge smooth zinc, natural hand rubbed highlight finish. Handcrafted Metal takes pride in our very high quality craftsmanship. We see your Zinc Commercial Bartops and Bar Tops order as an opportunity to deliver our uncompromising design and craftsmanship. 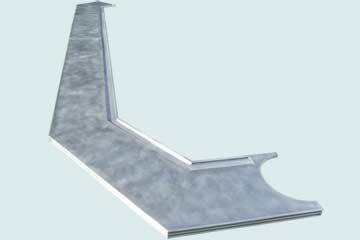 You can see that we offer an amazing variety of Zinc Commercial Bartops designs. Our 25 years of experience in building Custom Zinc Commercial Bar Top in large size, shape, and color gives us mastery of the essential methods, processes, and skills needed to produce a copper Commercial Counter that exceeds your expectations. 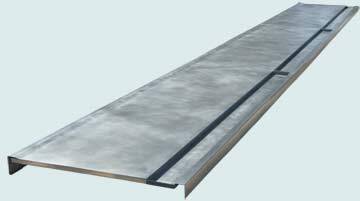 We have built thousands of Zinc Commercial Bartops. The vast array of styles, finishes, textures, and metals available for Handcrafted Metal Commercial Bartops provide almost unlimited choices. We offer an extensive selection of Zinc Commercial Bar Counter styles. Just browse the Zinc Commercial Bar Counter Style to see wide range of commercial bar counter top products. We are glad to answer any questions about any of our Zinc Commercial Bar Counter. Call 1-800-755-0310 to speak with a product specialist who will help you select and configure your ideal Zinc Bar Counter. Handcrafted Metal Bar Counters are built in a way to be the focal point of your Bar.